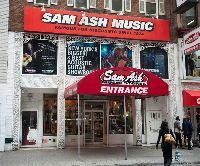 Forty-eighth Street was once famous for stores that sold musical instruments. Those stores catered to musicians of every stripe, but the vibe was very rock and roll. The names that stand out for me are Manny’s and Sam Ash, but there were several others, packed together, one next to the other, each a world unto itself. In my own private atlas of the city, that street was also notable for the degree its character changed in the course of one block, from Seventh Avenue to Sixth Avenue. The music stores, like the support of a seesaw, were the point at which that character made its pivot.